Medics prepare to move a crash victim to a waiting medic on Friday following a crash at the intersection of County Road 25-A and State Route 571. Tipp City firefighters, medics, and police tend to a crash victim following a multiple-vehicle crash on County Road 25-A near State Route 571 on Friday. 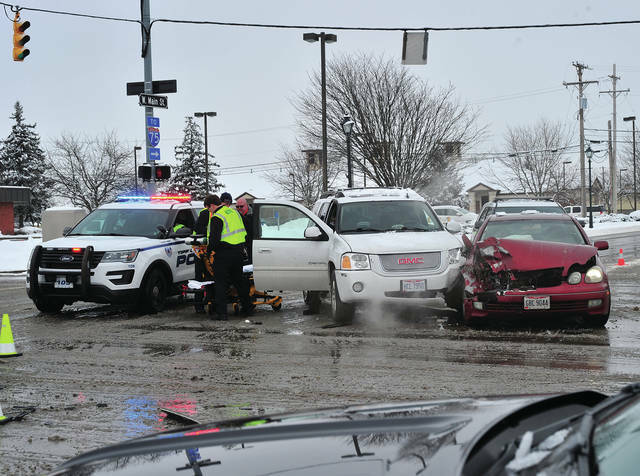 TIPP CITY — A multi-vehicle crash snarled traffic and caused several injuries on Friday afternoon. The crash — actually, a pair of crashes — happened shortly before 2 p.m. at the intersection of County Road 25-A and State Route 571. The first crash, involving three vehicles, happened in the intersection of County Road 25-A and State Route 571. The second occurred on County Road 25-A, approximately 80 yards south of the intersection. Tipp City Police are still investigating the crash, but officials on the scene said that there were three known injuries. 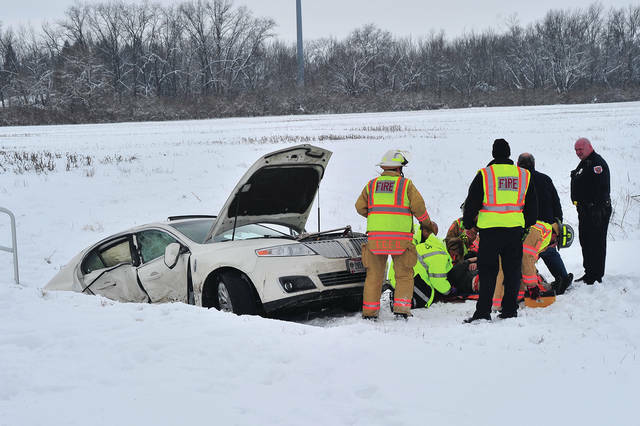 The two most serious were transported by Tipp City EMS to Miami Valley Hospital. A third victim with minor injures was transported by a mutual aid medic from Troy Fire Department to Upper Valley Medical Center. Traffic through the area was congested while the crash was being investigated and cleared but Tipp City officers, with assistance from Miami County Sheriff’s Deputies, kept traffic moving and first responders safe.